So much has changed since a September morning in 2001 — and now we have a generation for whom September 11 is ancient history. To keep the emotions and meanings of that day alive, we need to talk about it, to reflect, to learn — and to remember. In honor of the 15th anniversary of 9/11, I’d like to revisit a post from a few years ago when One World Trade Center and the Memorial were still under construction — a post about a birthday, a parent and child, a friend, and a tree that reminds us we are all survivors. This is one of those posts written at 3:00 am. I have a head cold and I’m awake. I couldn’t breathe — the congestion tide rolled back up into my sinuses and the only cure for me at the moment was gravity. So, I’m sitting up and thinking — and these are the middle-of-the-night ramblings of a stuffy, sleepy me. I think it’s safe to say that we all feel the world is falling apart. By now, we’ve been bombarded with news stories of crime and climate change, disrespect and disillusionment, violence and epidemics, extremism and fanaticism, terrorism and war. And now we have to come to grips with beheadings and crucifixions. Our 21st-century life has been turned back hundreds and hundreds of years. At moments like this, I want to retreat into my garden. I feel safe there. The sad truth, though, is that the world has always been a crazy place. Just look at the history that isn’t too far in the past. The Holocaust. JFK’s assassination. And MLK. And RFK. Son of Sam. AIDS. Oklahoma City. 9-11. Yet, it is during these times of evil that so many people rise to the challenge to remind us that there is goodness in the world. 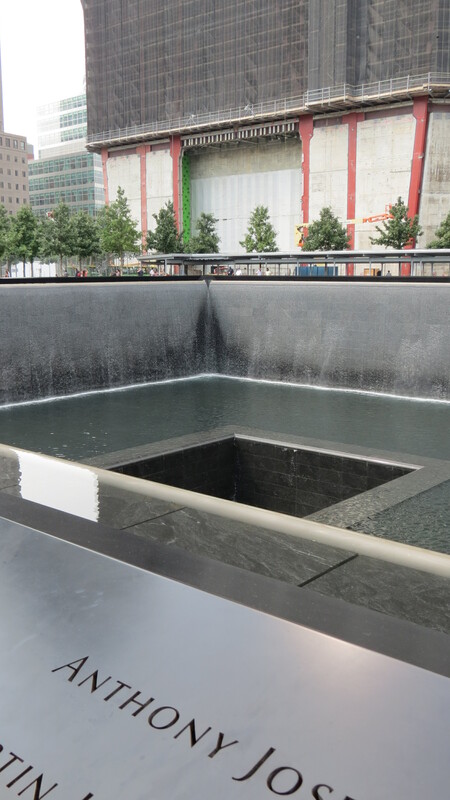 As we approach another September 11 anniversary, I would like to revisit a post that I wrote several years ago. It speaks of tremendous sadness, inspiration, and, most importantly, hope. Hang in there, everyone. This post features photos of the Suffolk County, Long Island, 9/11 Memorial, which honors the 178 County residents who perished on a crystal clear September morning. I recently visited the Memorial for the first time, morning dew coating each pane of glass, which is etched with the name of a resident and an emblem. The glass panes form a room of sorts, with manicured landscaping on the outside and an inaccessible garden of native plants on the inside. The inner garden is designed to grow untamed, symbolizing the passage of time. Less than five minutes away from this Memorial is the new one, which is the basis for this post. In the New York metropolitan area, 9/11 never really goes away. It’s always present. 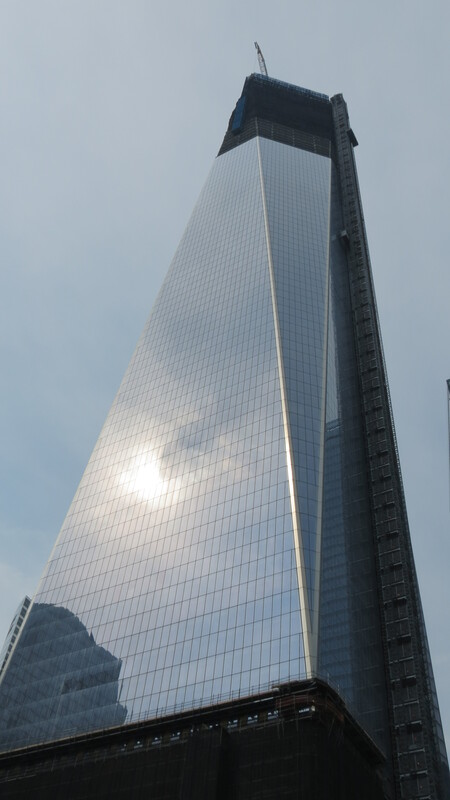 Throughout the year, the news media provides updates on the construction of the Freedom Tower and the deaths of rescue workers who were exposed to Ground Zero’s toxic dust in the days following the attack. And as the anniversary approaches, 12-year-old footage is re-aired as a precursor to all of the memorial services, the largest of which — the one at Ground Zero — is usually broadcast. In between are the smaller, more localized ceremonies, since so many towns and community organizations have their own 9/11 memorials. It’s difficult to avoid the emotion of the day. September 8th was Joe’s birthday, and we headed into NYC to celebrate. We did the same thing eleven years ago, and on that particular day, the air had the first hints of autumn crispness. We commented all day how especially blue the sky appeared, and how clearly we could see all of the buildings. 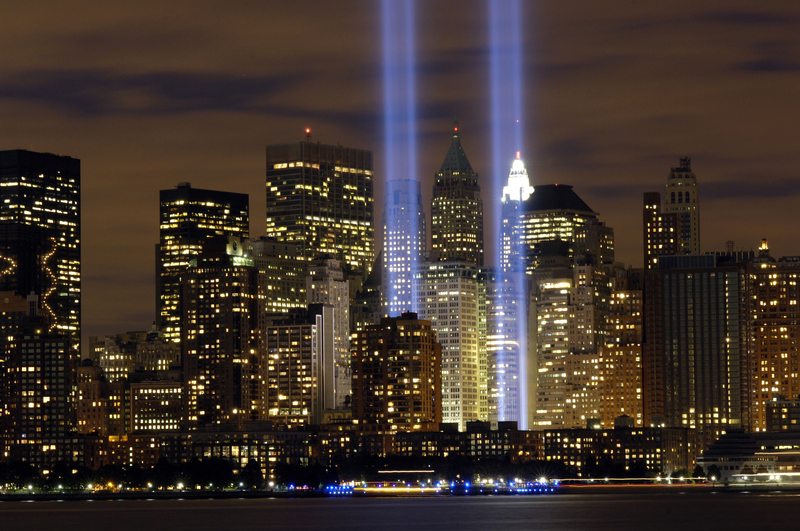 Three days later, the world changed – and now, September 11 is a day that still haunts me. Like so many other people, I have clear memories of where I was and what I was doing — as clear as the sky that day. I remember conversations that I had and every single emotion of every single second. Eleven years ago, I was working in a middle school – and while I do not want to go into all of my details that day, there is one moment that I cannot forget. As the tragedy unfolded, parents arrived in a steady stream. I was helping in the Main Office, signing their children out of school. Many of adults had spouses working in downtown Manhattan. One mother arrived and asked for her son. “I’m not taking him home,” she said as I looked up her son’s schedule. “I just want to hug him.” I caught my breath, my eyes blinking away tears as I focused on the computer screen. When I returned with her son, they stood in the hallway and just were. It was an intimate moment between a parent and child, consoling and comforting – and it is a moment that still moves me to tears whenever I think or speak about that day. Eleven years later, Joe and I are at the site. Each time we have made this visit, at different stages of redevelopment, I feel I have to brace myself. 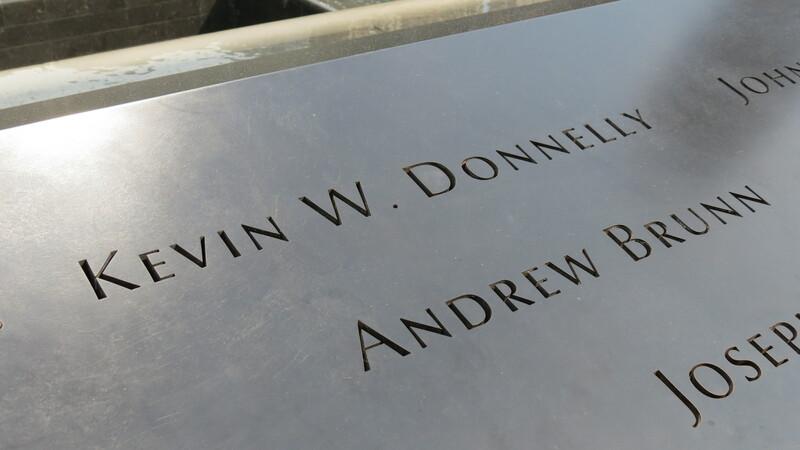 I think of that mother and her son, of so many victims and their families and friends, and I think of Kevin Donnelly, a man who hired the middle school me to mow lawns one summer. 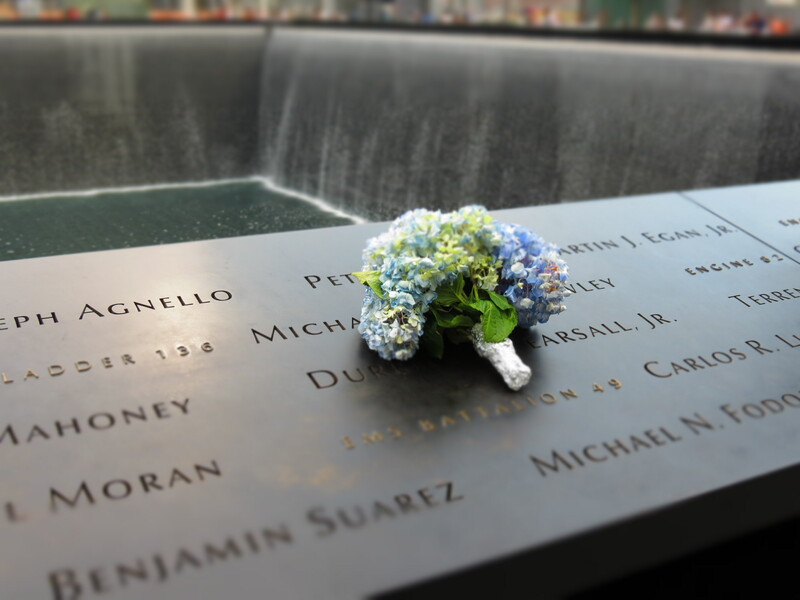 Today, the 9/11 Memorial occupies Ground Zero. Two pools now sit in the Twin Towers’ imprint. The pools, surrounded by thirty-foot walls of cascading water, eventually descend into a center void. The bronze rims of the pools are engraved with the names of the victims. Although the area is surrounded by the sights and sounds of rebuilding, it is amazingly quiet and somber and moving. It is not uncommon to see people placing flowers on the rim, carbon rubbing a specific name, praying and consoling each other – just like a mother and a son from eleven years ago. That’s where my mind was when I noticed the tree. 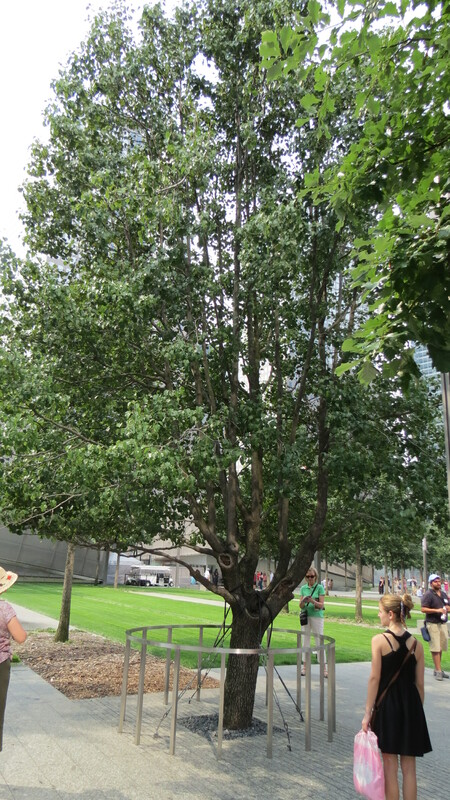 Adjacent to the pools is a garden where all of the trees are Swamp White Oaks – all, except for this one tree; a Callery Pear Tree that is protected by a railing, where visitors line up and pose for pictures, as if this particular tree is a celebrity. This is The Survivor Tree. The tree was originally planted on the World Trade Center plaza, on the eastern edge near Church Street, in the ‘70s. After 9/11, workers found the damaged tree – reduced to an eight-foot-tall stump in the wreckage at Ground Zero. The tree was removed to a NYC park, where it was nursed back to health. New branches sprouted, blossoms opened in spring, and the tree eventually reached 30 feet. In March 2010, however, the tree was uprooted by severe storms – but it still survived with the help of its caretakers and its will, if we could think that a tree has a will. 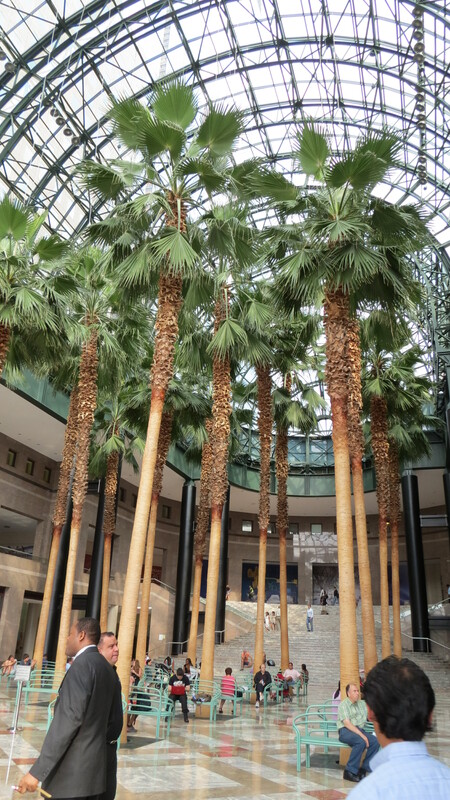 In December 2010, the tree was returned to the WTC site, where it sits just west of the south pool – a symbol of strength and resilience. It’s no wonder that so many people wait in line to be photographed next to the tree. Sometimes we all need a tree – or a parent, a partner, a friend, a stranger – on which to lean, much like we all did on 9/12 and the weeks, months, and years following. The more I think about that tree, the more impressed I am. It fought to live so that we – regardless of our gender, sexual orientation, race, religion, ethnicity, ability, and political views – could enjoy its shade, appreciate its blooms, and find comfort in its hug and wisdom in its story. It’s unconditional – just being, like that mother and son embracing each other in a school hallway eleven years ago. And yet, there is still no museum at the site – because of bickering over funding. Yes, years of bickering. While I personally do not need a museum to remind me of that day, I know that there are many young people who were too young or not even born to understand the events of 9/11. On a similar note, this is an election year in the United States, and both parties are going to great lengths to widen the rift between their constituents. Yes, September 8th was Joe’s birthday and we headed into NYC to celebrate. We did the same thing eleven years ago, and three days later, the world changed — but have people changed? Perhaps we should let that Survivor Tree be our teacher. There’s so much we could learn from it – we just have to be willing to listen. Update: Last night, on the eve of September 11, it was reported that the mayor of NYC and the governors of NY and NJ had reached an agreement on the museum. Construction is scheduled to resume, with a completion goal of September 11, 2013. This is not the post that I was planning for today. In fact, this is actually the post that I debated writing. The truth is, I have a very difficult time with September 11. There is a large part of me that actually dreads the date, that wishes we could remove it from the calendar. And now, on the 10-year anniversary, that feeling has been doubled. Just talking about September 11, no matter when, brings tears to my eyes — and so I do my best to avoid it. I have stopped watching the news for the weekend. I do not want to see memorial services. I do not want to hear speeches. I do not want to relive the day through newly released video footage. Everything I need to know is in my mind.